Consider this a prequel to the Fairlight CMI post. 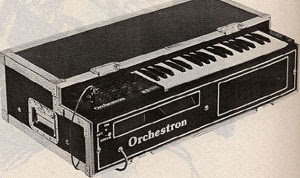 The Orchestron was a competitor to the Mellotron in the mid-seventies, and a professional remodeling of the Mattel Optigon, a preexisting cheaply built toy. It used actual recordings of instruments and voices put onto continuous loops on celluloid discs (similar to "locked grooves" on record albums), and played them back using optical sound (the same as in a movie projector). In theory, it should have been an improvement over the Mellotron; that instrument used lengths of audio tape that timed out after seven seconds, so you couldn't sustain a note indefinitely as you could with the Orchestron. However, the bandwidth on these things were awful. The sound was thin, scratchy, and muddy. The smallest bit of dust on the celluloid would result in pops and clicks. Only 50 Orchestrons were made, and sold at $2,250 retail. I picked one up for $60 at a flea market in Oakland in 1996, having no idea what it was. It included four Orchestron discs and a couple Optigon discs. My bandmate reconditioned it for me, I kept it in my studio for a couple years but never recorded with it, then we sold it for $300 and split the profit. It's an incredibly cool gizmo, but who needs a trashy sounding 100-pound laminated particleboard box sitting around the house? While Kraftwerk were touring America on the 1975 Autobahn tour, they purchased an Orchestron and used it extensively in their next three albums (especially Radioactivity, their finest effort). Here's a guy demoing the instrument and playing some respective parts from those tunes. How does it work, though? When you hit a key, does it just lower a needle into a groove in the disk? If so, there is a groove for each key? It's optical sound, just like a motion picture film soundtrack. There is no mechanical contact with the celluloid disc; it's just a lightbulb under it and a light sensor over it. The sound is simply printed on with lithography or silkscreen. The disc spins continuously as long as it's loaded, so there's a sound loop for every key constantly going. When you press down a key, you're just closing an audio line to hear the signal. Hey, that's cool about "pocket calculator". I had no idea all that equipment was off-the-shelf toys. Regarding another instrument used in "pocket calculator" but not interesting enough to get its own retrotech post, here's a little clip of some dork playing his stylophone. Like the optigon, it was originally sold as a children's toy. These things use very rudimentary circuits, and I plan on building one soon.